Okay so when I waypoint a map and I see it in the data maps folder <map>.waypoint.cache but the bots are still stuck and wont move unles the get a pickup. What can I do to fix this? You have to add waypoints using the waypoint editor. Check e.g. 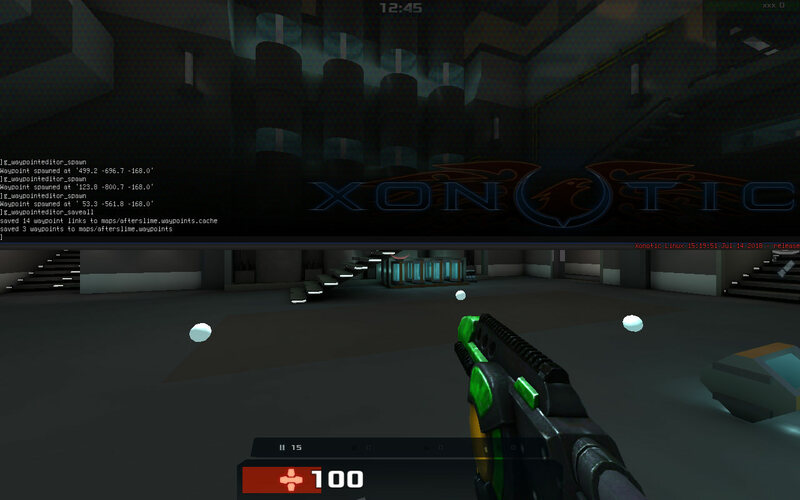 https://forums.xonotic.org/showthread.php?tid=4861 for reference. (07-13-2018, 01:47 AM)Mario Wrote: You use the console command g_waypointsprite_saveall to create the .waypoints file. I tried the command four times, and all it says is unknown command so idk. 2) Use g_waypointeditor 1 to enter waypoint editing mode. 4) When your map is "full" of waypoints use g_waypointeditor_saveall to save the map.waypoints.cache and map.waypoints file. Also try not to spawn them midair(falling/jumping) it's a pain getting rid of them and bots won't care about them anyways. Lastly maybe post a screenshot showing your waypoint layout. (07-16-2018, 02:43 PM)_para Wrote: Ok assuming you did create them and saved them correctly... so when reopening the map and enabling the waypointeditor you should see the waypoints and connection from you to your nearest waypointss(probably). First thing you could try is that ...g_waypointeditor_relinkall (something with _relinkall ... or try command: "search relinkall" and it will list it) command. Next thing could be the logic the bots are following your waypoints with. They are not really smart but they will generally find their way. So if their hp is low they could camp a healthpickup if theres no spawned elsewhere (each pickup(also jumppads and portals) generate their own waypoint). Just create waypoints rather generously I'd suggest like when having a door at least one on each side or 2 on each side for the corners. At the start of a staircase and right when the staircase ends and your new point still sees the last point. Yes, Still doesn’t work. All it does is make a waypoints.cache. No waypoint file. And I have to waypoint the map every single time cause it doesn’t show the ones I did I. Does anyone know why nothing happens after I enter g_waypointeditor_saveall?? Ive looked at the Guide and I add them and yes they are all on the ground none in mid air, But I still cant generate a waypoint file. sometimes it doesn't even update the current waypoint.cache file.